A perfect dish for summer greens and an authentic meal enjoyed all over Greece. 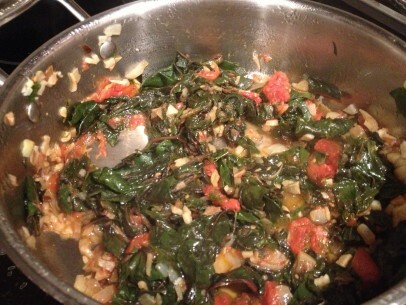 Swiss chard, beet greens and vleeta/amaranth all are good choices for this recipe. It’s just as delicious warm from the stove or packed in a picnic lunch and good to the last bean! 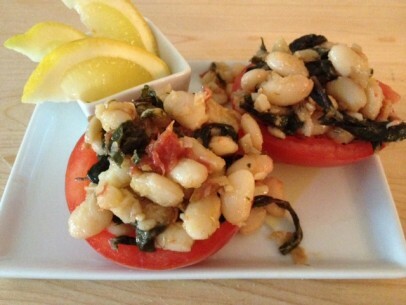 Northern white beans are my favorite in this dish with their creamy, meaty texture. Fresh dill, tomatoes, onions and garlic round out the simple ingredients and give you a tasty, traditional, nutritious meal you’ll love to make again and again. I’m a fan of the quick soak method for my dried beans, as I usually don’t remember/have time to soak them overnight and it works fine every time. Just fill a pot with dry beans, cover with water and bring to a boil. Remove from the heat, cover and let sit for an hour and you’re good to go. Just make sure to rinse off your beans after soaking. It gets rids of some of the starchiness and gives you a creamier bean texture. You can use a variety of different greens in this recipe. I’ve used red swiss chard here and regularly use beet greens and vleeta (amaranth) also as they’re all sweet, tender greens. Feel free to use the more bitter greens such as mustard or dandelion if your tastes buds so dictate. With swiss chard, remove the stems first and use only the leafy greens. Save the stems though. I like to sauté them in a little olive oil with onions and garlic and pair them with some fried potatoes. The stems are crunchy sweet and worth saving from the compost bin. I really like to use roasted tomatoes in this recipe because they add another layer of flavor to the finished dish. If you only have fresh tomatoes on hand and no time to pop them in the oven, just make sure to peel and seed them before chopping. I’ve also seen this dish prepared with halved cherry or grape tomatoes and, though very pretty in presentation, I suggest you stick with fresh or roasted tomatoes for better flavor and texture of the overall recipe. It’s important to keep the heat under your pan on low while wilting/cooking the greens to make sure they come out tender and not tough or stringy. A 5 or 6 quart saucepan is a good size to wilt your greens in. It may seem a little big but the extra room will come in handy when its time to combine everything together. You’ll be able to mix the wilted greens and cooked beans without breaking up or mashing the beans. Tip: Fresh dill is a must here, don’t be tempted to use dried. 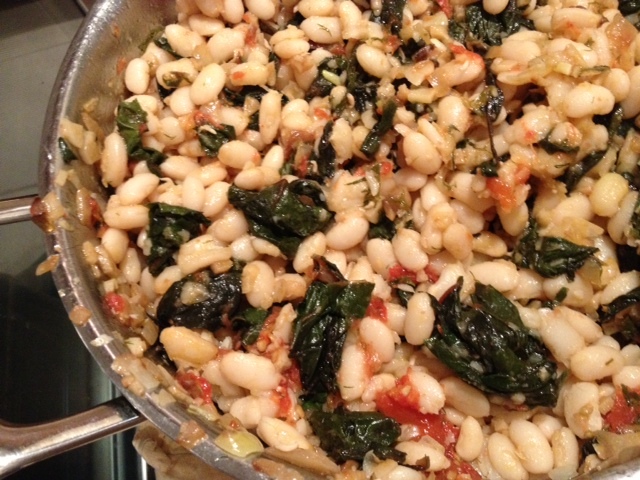 And a must-must – always add the olive oil in at the end once you’ve combined the greens and beans. The warm beans soak the oil right in giving you the most buttery delicious creamy good beans – so, remember to add the olive oil! I love to finish with a squeeze of fresh lemon juice and pair with a piece of crusty bread and glass of dry white wine for a hearty meal. Or fill a scooped out half of a tomato and you have a lovely appetizer as pretty as it is tasty. 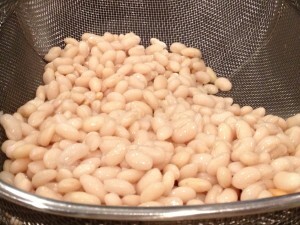 Quick soak: Add beans to pot, cover with water by about 2-3 inches. Add 2 tsp of salt and bring to a boil. Remove from heat and cover. Let stand/soak for 1 hour. Drain, rinse and set aside until ready to use. 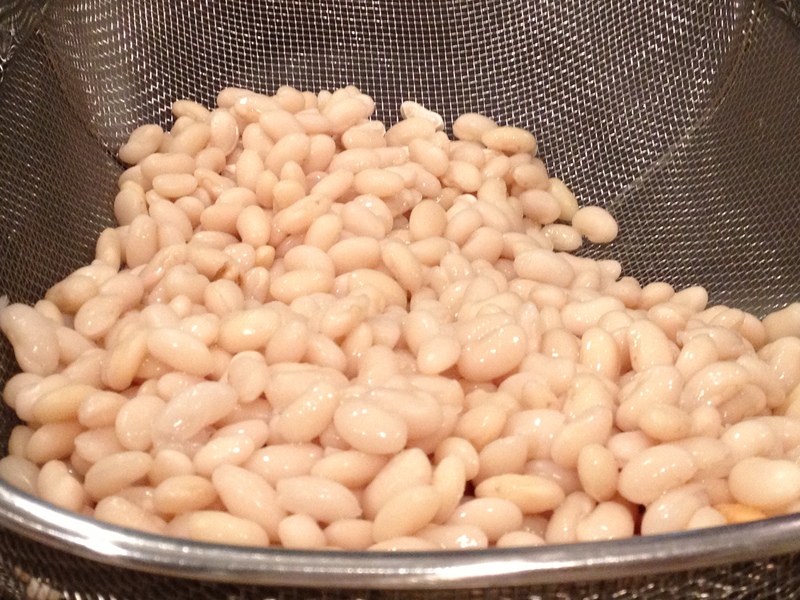 To cook beans, add them back to the pot and cover with water by about 2-3 inches. Bring to a boil and lower to simmer. Cover and cook for 40 minutes until tender. Saute onions and garlic in 1/4 cup of olive oil under tender in a 5 or 6 quart saucepan (at least a 3 qt. saucepan). Add chopped greens and cook gently until greens begin to wilt (approx. 5 minutes). Add chopped tomatoes and dill, cover and cook over low heat for 20 minutes until greens are tender. 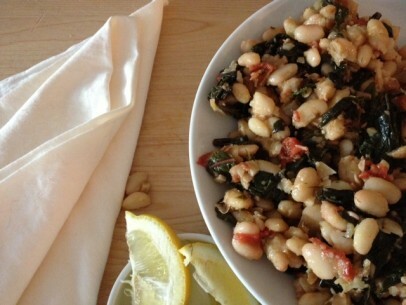 Add cooked beans to wilted greens. Add remaining olive oil, a squeeze of fresh lemon juice and combine well but gently. Season to taste with salt/fresh ground black pepper. Serve warm or room temperature with crusty bread. Garnish with lemon and fresh dill. Kali orexi! The dill!! The dill was perfect! Thank you so much for this beautiful website that takes me back to my Yiayia’s table!! Your recipes are amazing! I’ve already made this dish three times in the past two weeks! great looking recipe. Can you substitute canned beans in a pinch?